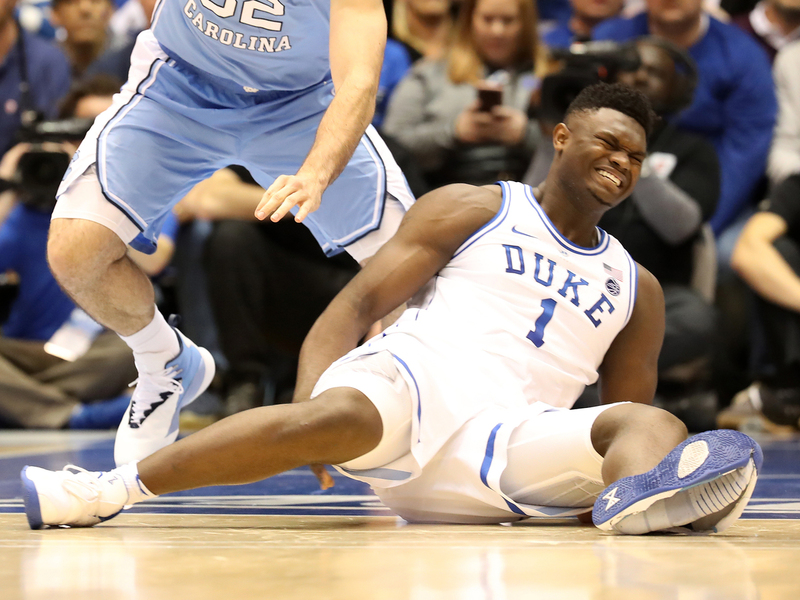 A Blown-Out Sneaker, An Injured Zion Williamson And A Night To Forget For Nike In the most highly anticipated college basketball game of the season, Duke star Zion Williamson was injured when his sneaker ripped apart at the seams — an embarrassment for Nike. Duke's Zion Williamson reacts after falling as his shoe breaks in the game against the North Carolina Tar Heels Wednesday in Durham, N.C. It was the most highly anticipated college basketball game of the season: Duke was facing archrival North Carolina, with the spectacular talents of Duke's freshman sensation Zion Williamson on display. Former President Barack Obama was there. Tickets for the game were reselling for more than $3,000 — Super Bowl prices. Duke's exuberant student section, known as the Cameron Crazies, was extra hyped. And then a mere 33 seconds into the game, on a routine play, Williamson dribbled near the foul line when his left leg buckled, his left blue-and-white Nike sneaker ripped apart at the seams and he tumbled to the floor, grabbing his right knee in pain. Williamson limped off the court. Hearts sank everywhere. Obama visibly mouthed "his shoe broke." And in mere seconds, Nike was facing a marketing nightmare. The offending shoes were stashed away by a trainer. But the images of the young star being felled by his footwear couldn't be erased. On social media, messages of concern and sympathy for Williamson were mixed with dishy remarks about the shoes. A Nike rival tweeted, "Wouldn't have happened in the pumas." The tweet was later deleted. In a statement, Nike said it was "obviously concerned" and wished Williamson a speedy recovery. "The quality and performance of our products are of utmost importance. While this is an isolated occurrence, we are working to identify the issue." Thankfully Williamson's injury does not appear to be serious. Though the freshman didn't return to the game, Duke's coach Mike Krzyzewski described it as a mild right knee sprain. But Williamson's shoe implosion is an embarrassment for Nike, which also had a problem in 2017 with NBA jerseys that were tearing. But whether it will have any long-term impact on the world's largest sports apparel brand is another matter. Nike's shares were down about 1.7 percent in late morning trading — not good news, but not a major selloff. Nike's markets are so global and its products are so diversified that it's unlikely the sad fate of one shoe will have a meaningful impact on sales. But then there's the young man who was wearing those shoes — Zion Williamson. Possessing a unique combination of leaping ability, power, speed and basketball IQ, he is widely expected to be the No. 1 pick in June's NBA draft. At a mere 18 years old, his skills, athletic ability and court demeanor are already being compared to LeBron James'. Companies will be vying fiercely to sign him to a multimillion-dollar shoe deal. And when he plays his first NBA game, likely later this year, millions of people will be watching; many will be looking at the brand of sneakers he's wearing. Nike had better hope the memories of what happened 33 seconds into the North Carolina game don't stay top of mind for Williamson.